dominika's notebook: Glorious People’s Revolutions and how the West got it wrong. Glorious People’s Revolutions and how the West got it wrong. I am not sure if comparisons to revolutions of 1989 in Eastern Europe do a full justice to what is going on in the Middle East. What started in Tunisia and is happening now in Egypt is truly a People’s revolution. Without prominent leaders. And without organized opposition movement. Power to the people! And please, honor to the People. Let’s remember that, contrary to current events in the Middle East, the 1989 in Eastern Europe was possible as a result of almost 40 years struggle of organized opposition actions with the most powerful Polish Solidarity lead by Lech Walesa. People followed the great leaders and the great movements. In the Middle East, the organized opposition, neither in Tunisia nor in Egypt nor elsewhere in the region, has ever gained this kind of momentum and leadership. It’s the people, who started it. And it is the opposition that is trying to follow the people. So now, first in Tunisia, now in Egypt, ‘the impossible’ is happening on our eyes - despite the weak opposition movements and despite the pessimistic anticipations of both Western and Middle Eastern intellectual elites. Even after events in Tunisia, many Egyptian scholars were convinced that the revolution would not spread into Egypt. Well, surprise. A good and glorious surprise. So what has happened? For decades, it looked like the entourage and propaganda of the Middle Eastern regimes had overpowered its own societies. It becomes clear that people of the Middle East might have been ignored and overshadowed, but not silenced. And certainly not left powerless. In fact they are far ahead of its leaders and institutions of power in terms of the political awareness, ways of participation and vision. People of Tunisia and Egypt, empowered by the means of modern communications, are stronger and more resilient than anyone could have anticipated. And they already managed to overcome the only real enemy of the people in authoritarian regimes – their own fear. They are equipped with the most powerful tools of globalized world – access to information and the real ability to influence the world’s events from the very bottom, from the streets of downtown Cairo and Alexandria up to the heights of the Mubarak's palace. It all means we are facing the absolute collapse of the established hierarchies of power and witnessing the amazing rise of people’s empowerment. And this is a great achievement on its own, something worth celebrating also in the West. In the ongoing debate about future for Egypt, be it democratic or not – we tend to forget that individual empowerment is perhaps the greatest injection of democratic spirit that anyone could imagine. The entire discussion whether Egypt will have a Western – stylized democracy or not, is really a secondary discussion here. Meanwhile, the Western opinions (including my native Polish) are obsessed with two issues. First one is related to the anti - Islamist fears that are currently en vogue and dominate the public imagination. While the Egyptians became fearless, the fear in the West is rising. Let’s remember that Egipt, IS, surprise surprise, a predominantly Muslim country. And indeed, the we face a signes of islamisation of the Middle Eastern societies. Back in the 30ties, women in Egypt did not wear a hijab. Today it’s at the peak of its popularity. But as history shows, Islam is not evil per se. Yes, it can be used and abused (like in Iran), like any ideology - religious or not, but it does not necessarily imply the threat the ‘the West’. Fuelled by this fear of Islam, large part of the coverage of ‘Egyptian crisis’ as Western media call it, concerns the potential threat of Muslim Brotherhood ‘hijacking’ the Egyptian revolution. 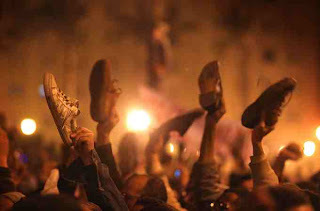 Muslim Brotherhood is one of the oldest opposition movements in Egypt. In recent years it has been more focused on the much-needed grass- root organic work within the Egyptian neighborhoods rather than terrorist activities. Ironically, while the US has been busy equipping the Mubarak’s forces with the latest military technology, Muslim Brotherhood has been involved in providing the social services to the poorest population. 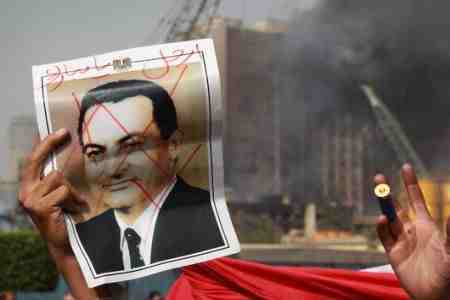 Yet, it is not the Muslim Brotherhood that inspired the uprising. After initial refusal to support the protest, Brothers joined as ‘private individuals’. And they lost the momentum. The recent estimates (indeed - difficult to predict its credibility) suggest that Brothers can count of maximum 20% support of the Egyptians. This is a civic revolution. Meanwhile, one of the most telling pictures of Egyptian revolution is the one of Copts (Egyptian Christians) protecting the Muslim prayers on the Tahrir Square in the shape of the cordon that separates them from the Mubarak police so they can prey in peace. I really cannot find the more telling example of minority protecting the rights of majority. The second issue that dominates the coverage of Egyptian uprising concerns the issue Israel’s security. As if Israel’s well- being was to be the single most important outcome of the revolution at the Nile River. As much as one can understand Israeli legitimate concerns about the implications of Egyptian turmoil, these concerns should not hijack other people's strive for more freedom and prosperity and less oppression. Israeli fears expose how much societies of Middle East, Arabs and Jews, desperately need a new ways of co – existence that would be not based on alliances with corrupted regimes at the expense of people. Meanwhile, can we please worry about the security of the brave protesters on the Tahrir Square at least as much as the security of Israelis? Life of an Arab is surely worth as much as life of a Jew. And they are both priceless. No matter what will be the immediate results of Egyptian uprising, and unfortunately Mubarak’s seems to be holding strongly, the impact of People’s revolution couldn’t be greater in the larger perspective at least in two dimensions. First of all, people of the Middle East have just told their own governments – that they would no longer accept treating them like puppets. They have just proven that even most ruthless regimes are, at the end of the day, accountable in front of its own people. And that the people can be oppressed for decades, but they can be never defeated. It’s the great lesson for Middle Eastern political elites. And the fact that this lesson is coming not from Washington or London, but from their own people, serves as a second meaningful development. This revolution is not about West. It is neither pro- Western or anti - Western. It has its own voice and speaks for itself. And painfully exposes how much the West had screwed up in the Middle East, how much it supported the wrong sides and how much it ignored the people of the region.